Before you get started, take a look at what you put in your pantry and toss things that you don’t use anymore. Getting rid of that old bag of sugar and dusty canned beans will help free up some of your storage space. If you live in an older house, your pantry is probably woefully out of date. Food packaging, can sizes, and the food we store changes over time. An updated pantry design will take contemporary foods and packaging sizes into account and adjust the shelves accordingly. Personal and family needs are another thing to take consideration when designing a pantry. A specialized diet might require different kinds of space and shelving. For instance, if you pickle your own vegetables or make jams, more jar space may be needed. Families also grow and change, and you may need a larger pantry to fit your family’s needs. When all the shelves are the same size, it is easy to put that box of cereal anywhere. But if the object will only fit on one particular shelf, it is more likely to be placed in the right spot. Different-sized shelves for specific items will make it easier to find things when searching. It will also keep the pantry tidier. 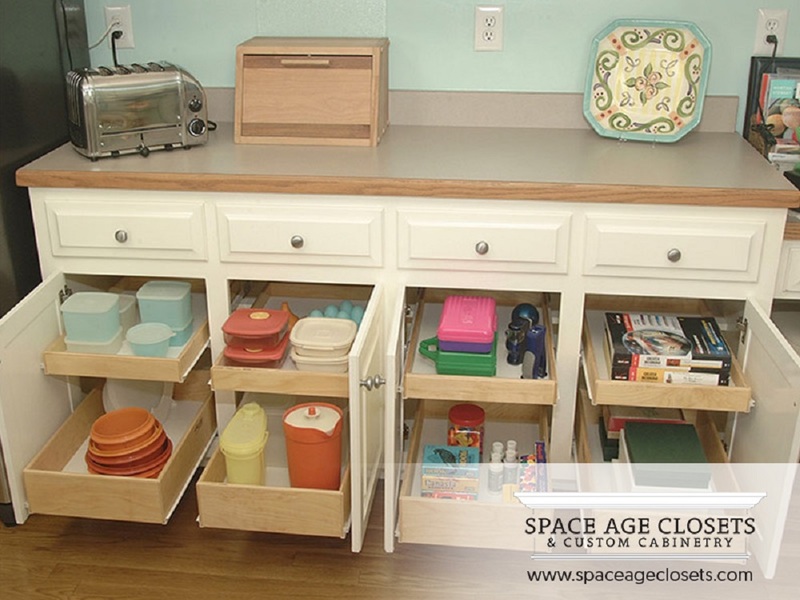 Adding pull-out drawers to your pantry will make it look less cluttered and can maximize space. Drawers can be easily labeled and be more organized. They also make it easy to reach the very back of the drawer, which is particularly convenient for seniors and folks with disabilities. Looking to make more storage space in your home? Space Age Closets and Custom Cabinetry has been serving Toronto and the Greater Toronto Area for over 30 years. Our staff have decades of experience, and a reputation of excellence in customer service and quality craftsmanship. We can provide custom closets and custom shelving for your home or business. Contact us today for a consultation!